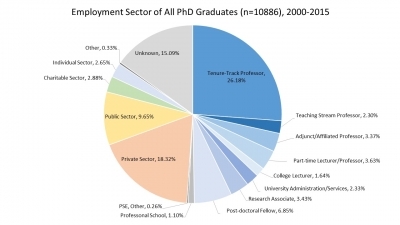 The 10,000 PhDs Project used publically-available information to determine the current employment positions of the 10,886 individuals who graduated with a PhD from U of T in all disciplines from 2000 to 2015. The number of PhD graduates increased almost 2-fold from the year 2000 to 2015 with the biggest increases in the physical and life sciences. About an equal number of women and men obtained PhD degrees, although this varies in some disciplines. The study found that about 1/3 of PhD graduates become professors. Increasingly, PhDs are finding careers in the private, public and charitable sectors, especially those graduates in the physical and life sciences. While the 2/3 of PhD graduates find employment in Canada, they are also employed in the USA (21%) and close to 100 different countries. The employment outcome data from the 10,000 PhDs Project is available on the School of Graduate Studies web-site to assist students in making more informed choices about their own career paths. Departments and Faculties within the university have responded by enhancing professional development opportunities for graduate students to facilitate their transition from school to work.